In a medium saucepan, combine the apple cider vinegar with the sugar and 1 cup of water and bring to a boil. Add the pearl onions and a pinch of salt. Transfer to a heatproof jar and let cool completely. Refrigerate overnight. In a medium saucepan, cover the potatoes, lemon zest, dill stems and peppercorns with water and bring to a boil. Add a generous pinch of salt and simmer until just tender, about 20 minutes. Remove from the heat and let the potatoes cool in the cooking liquid, about 30 minutes. Drain well and discard the aromatics. Cut the potatoes into 1/4-inch-thick slices. In a small bowl, whisk the mayonnaise with the chopped dill, mustard and white wine vinegar. Season with salt. Cut 4 of the pickled pearl onions in half and separate the layers. Reserve the remaining onions for another use. Spread butter on the rye bread and arrange the potato slices on top. Dollop the dill mayonnaise on the potatoes and season with salt and pepper. 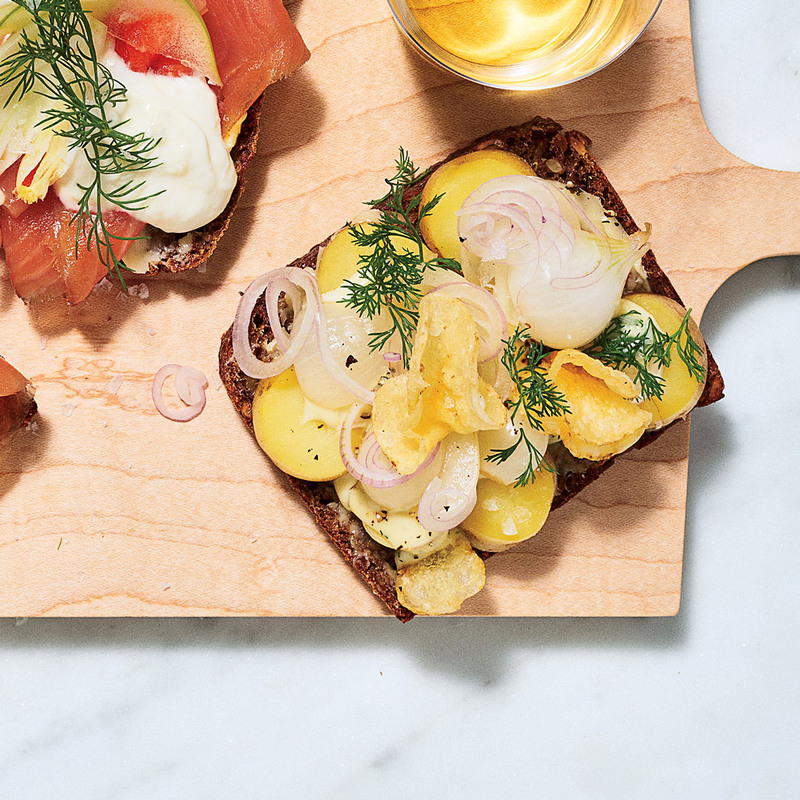 Garnish with the pickled onion petals, sliced shallot, dill sprigs and potato chips; serve immediately. The pickled pearl onions can be refrigerated for up to 5 days. Thawed frozen pearl onions can also be used for this recipe. Review Body: Never thought a potato inside a bread would taste so good! Review Body: I'd add cheese to those potatoes and close the sandwich wonderfully. Review Body: A potato sandwich? I guess you see new things every day.